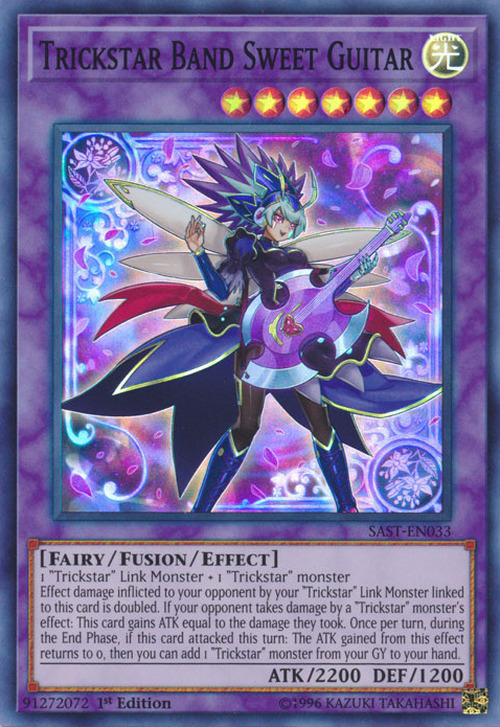 Effect damage inflicted to your opponent by you "Trickstar" Link Monster linked to this card is doubled. If your opponent takes damage by a "Trickstar" monster's effect: This card gains ATK equal to the damage they took. Once per turn, during the End Phase, if this card attacked this turn: The ATK gained from this effect returns to 0, then you can add 1 "Trickstar" monster from your GY to your hand. This card is the first Trickstar Fusion Monster. This monster appears in the card artwork of Trickstar Live Stage. This card is based on Solanum dulcamara, also known as Bittersweet nightshade.